I kind of went all in with these Carrie Fisher books because of a deal I got on Audible book credits. It was that plus not really knowing what other books I wanted to read and so I ended up with sticking with her and got all of her memoirs in one go. Shockaholic is her second memoir and quite the heavy one at that which is more focused on her mental state and not so much her history as Princess Leia despite the figurine on the cover. It's just as brutally honest as Wishful Drinking was but also rather serious yet somehow comedic at the same time. And again this audio book is a recording of Fisher reading her own work. She has a lovely cadence to her speech that is distinctly her own and one that we'll forever miss given her passing. Synopsis: Shockaholic is a memoir by Carrie Fisher and a sort of follow-up to her prior memoir Wishful Drinking. It adds on to her stories of her life with perhaps some overlap to her other biography but not quite as well. As the title indicates, one of the initial pieces that she addresses in this book is her shock therapy. She had mentioned her treatment in the other book but here she really goes deep into it and describing the process in vivid detail and what it means to people in her condition. It's intimate and somewhat jarring at times but it really sets the tone of the book as a whole - open, honest and with her being more than able to laugh at her own life. This is not a book about her life as Princess Leia. Instead it's an honest sharing of her life and her relationship with her parents and all that fun stuff. We hear of her encounter with a Kennedy and even a lot of stuff about her friend Michael Jackson and it's all quite fascinating. She talks about each subject for as long as she wants to and then ends just as abruptly. You'll get enough but never too much and it's all quite magical. What I Liked: The whole book, especially the audio book, feels like you've just sat down for tea or coffee with Carrie Fisher and she's telling you another story of her life. Each chapter is one such encounter and her naturally ability to tell a story really sings through. Even as an audio book she makes you feel at ease as she talks about her celebrity parents, of eccentric dentists and so much more. She's an amazing writer with a flair for applying her rather sardonic sense of humor to a retelling of stories of her life. It's not just how she tells the story in this audio book but the very words she use to convey a strong sense of self as you immerse yourself in her life. And she really does take you away. What Could Have Been Better: The book doesn't have a narrative structure and you pretty much bounce around to various points of interest in her life. We start by discussing her electroconvulsive therapy sessions but then start talking about her life and her parents and so on. I know it's a memoir and not a straight up narrative that needs a beginning, middle and an end but you can't help bu want to make sense of things. And there is that sense of you wishing she talked more about herself and not necessarily the people around her. I understand wanting to discuss her fathers to varying degrees and family is sort of fair game in books like this. But then you have the bit about Michael Jackson which went on for quite a while. I guess she felt somehow obligated to set the record straight somehow given Michael's death. It's a noble effort and well-written, but felt somehow disjoint from things. 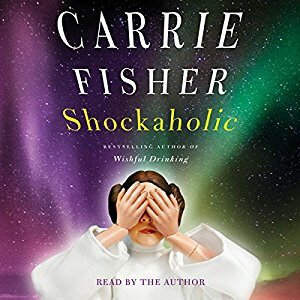 TL;DR: Shockaholic is another great memoir by Carrier Fisher and acts as a lovely preservation of these parts of her life in a format that can be enjoyed by friends and fans alike. She doesn't really pull punches and you don't want her to since it's that same fire that endeared Princess Leia to so many of us. Thus the book gets a good 3.5 references to drug use out of a possible 5.